Built to do it all. Tundra offers more ways to tow some of your biggest toys. 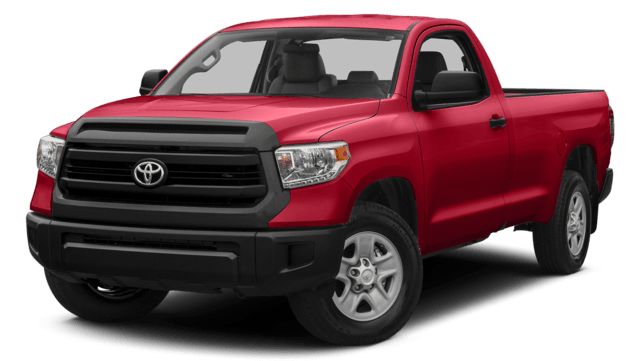 Sixteen different configurations in six trim levels can all tow 10,000 lbs.1 or more, and the 4×2 Regular Cab Long Bed with available 5.7L V8 can haul up to 2,080 lbs.2 Included on Tundra models with the 5.7L V8 is the TOW/HAUL Mode that intelligently holds lower gears longer, so Tundra won’t keep shifting or “hunting” for the right gear when towing. And this system also increases throttle response, pulling power and engine braking, helping you tow with confidence. It doesn’t matter if you’re hauling your boat or a full load of lumber1,3—when you come to a stop, you want your trailer to do the same. Lucky for you, an Integrated Trailer Brake Controller4 comes standard on all 2017 Tundras equipped with the 5.7L V8. When connected to a compatible trailer, this system will allow you to adjust the amount of trailer braking based on the weight of the trailer. In other words, it’s one more way Tundra gives you more control over what’s going on behind you. Big trucks tow big toys, so Tundra comes standard with Trailer-Sway Control (TSC).5 TSC works in two ways: by detecting trailer sway and applying brake pressure at individual wheels, and by controlling engine torque to help stabilize the trailer, and your precious boat. 3 “Payload capacity” is the calculation of GVWR minus curb weight and should be used for comparison purposes only. Actual curb weight, as opposed to the published curb weight, is affected by added vehicle equipment, as described below in the towing disclaimer. 4 The Integrated Trailer Brake Controller is an electronic system that operates in tandem with a properly equipped trailer with an electric braking system. It is designed to help the driver maintain trailer control by increasing or reducing trailer braking based on trailer weight. It is not a substitute for safe towing practices. Factors including speed, road conditions and driver input can all affect trailer braking control. See Owner’s Manual for details. 5 Trailer-Sway Control (TSC) is an electronic system designed to help the driver maintain vehicle control under adverse conditions. It is not a substitute for safe driving practices. Factors including speed, road conditions, weather and driver steering input can all affect whether TSC will be effective in preventing a loss of control. See Owner’s Manual for additional limitations and details.